The colour white has many valuable benefits. Paper, for example, is white because it is an easy contrast to the most common colour of ink; black or blue. Surrender flags have been white since the Second Battle of Cremona in 69 A.D, because white is readily available and disguisable in a war field. In fact, it was not always used to mark surrender. In the east it had a different connotation, it was used to mark death. White has many benefits, but it should not be used for ring-side tables at a boxing fight. Part of boxing’s beauty lies in its ferocious nature, a restrained violence that simultaneously delights our primal and scientific instinct. White means you become all too aware of that. When the inevitable happens, the blood droplets are unmissable. For the second time this year. Good Counsel GAA club hosted the only pro boxing show in town. In an era of unprecedented turmoil, the ‘Celtic Clash 6’ card took place on Saturday to ensure Dublin is not totally devoid of professional boxing. 22 boxers, 11 fights in front of approximately 600 people. The question remains just what are nights like this doing for the sport? What does it all mean in the grand scheme of things? They are certainly serving a certain purpose for Irish boxing but one can’t help but wonder beyond that. Are these gifted pugilists working towards a rekindling of the nationwide affection for the sport, akin to Michael Carruth in the '90s, Bernard Dunne in the '00s? Or does it merely exist as a final requiem for a dying dream? Is this in actuality a fight of far greater proportions, a marginal group raging against the dying of the light? Take Victor Rabei, a promising and entertaining boxer and one of the performers of the night. 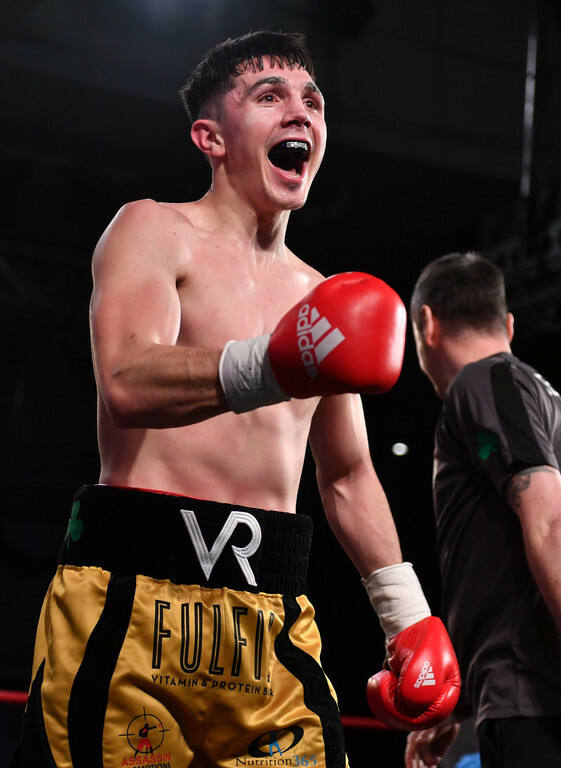 Rabei and fellow Dubliner Karl Kelly served up a relentless eight-round thriller. In the past, he has spoken about dreams of Irish stadium shows and World Titles. A promising, full-time professional committed to doing his all for himself and his sport. Prior to tonight’s bout, Kelly had forewarned he ‘mangles’ opponents who try to trade with him. The associated message was patently clear; run and hide, or there’ll be a knock-out. The pair did not contribute to the blemished ringside table but it was not for lack of trying. Kelly marched forward for the bulk of the contest, unleashing bombs with left and right upon Rabei’s swaying frame. Kelly chose his shots purposely. The right hand was cocked and ready whenever the left created an opening. But Rabei was slick and absorbed all that was offered. Regardless of the barrage, his shoulders shrugged and an ever-present grin persisted through the mayhem. There was no arrogance in that smile. This was a man enjoying the process, at one with his craft. His exuberance carried through to the end, as evident in the post-fight celebrations as it was during the match. The end result was a unanimous 78-75, 78-75, 77-75 decision in favour of Rabei. After the result was announced, Kelly marched to the corner of the ring and grabbed the BUI Celtic title that had been on the line. Belt in tow, he stormed towards Rabei with the same speed he had approached him with only moments before. But the intent was very different. With a quick embrace, a pat on the back and a shared laugh, Kelly presented the tile to Rabei and held his hand aloft. Or what of Eric Donovan. From an early age, there was national recognition that he was an exceptional talent. He became a European schoolboy boxer on the Irish national team. His sparring partners included Andy Lee, Kenny Egan, Katie Taylor and Paddy Barnes. Donovan has won five Irish Elite Senior Championships and a European bronze medal. However, one loss robbed him of his Olympic dream and the profile that came with it. Now 32-years-old, Donovan has his sights on one almighty stint in the pro game. The Athy boxer is desperate to see the return of pro boxing to Irish television and believes he is the man to help it get there. The goal is a European Title and that journey starts now. His old training partner and friend, Kenneth Egan, was in his corner tonight. The fight was only four rounds as it marked his return from injury. However, before departing the ring, he grabbed the mic and declared the post-mortems premature. Donovan secured a 40-36 win against Samuil Dimitrov in a fight that sees him become eligible for European rankings. He could yet secure an Irish Title fight later this year and with that comes the prospect of professional boxing on terrestrial television. That fight could be a possibility as early as September. Not only had Donovan featured on the show, he saved the main event. After Colin O'Donovan informed the Boxing Union of Ireland on the day of the event that he could not make the Super Bantamweight limit for his title fight with Carl McDonald, Eric Donovan stood in and offered his Celtic Featherweight title which they fought for instead. For the paid ranks, this is Dublin's greatest offering right now. A devoted unit of fight fanatics that came together to celebrate the city's best boxers. They screamed "G'WAN!" for every fight and they roared Maniac 2000 in between. The word ‘survive’ comes from both enduring but also preserving. That is what Irish boxing does on nights like tonight. Boxers like Stephen McAfee, Keane McMahon, John Joyce and Graham McCormack who all demonstrate the ability exists within the country. Their excellence allows us to imagine a new future for Irish boxing. A world separate from boycotts, shootings and scandal. One that makes headlines on the back pages, not the front. Nights like tonight are small in presence but large in importance because they remind us there is still hope for Irish boxing.